"Yummy, tender chicken with a Colombian touch!" Place chicken pieces in a bowl. Sprinkle with lemon juice, cover, and marinate at least 30 minutes in the refrigerator. Heat the olive oil in a skillet over medium-high heat. Mix the salt, pepper, and paprika in a small bowl, and sprinkle over the chicken. Place chicken in the skillet and quickly brown on all sides. Transfer chicken to a baking dish. 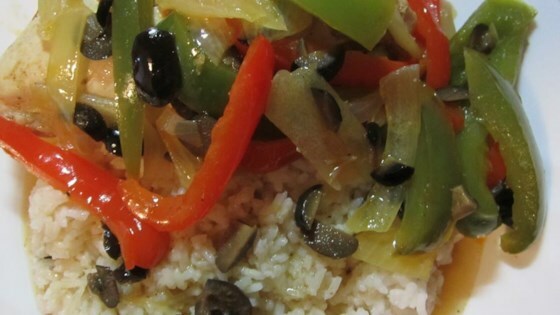 Distribute olives, onion, green bell pepper, and red bell pepper evenly in the baking dish. Pour orange juice over all. Cover with aluminum foil, and bake 45 minutes in the preheated oven, until chicken juices run clear. See how to make earth’s easiest (and possibly tastiest) roasted chicken. This was really good and very different. I used legs and thighs, but it turned out great! Great, easy dish! I served over rice (which helps soak up the extra orange juice) and pinto beans.